In modern times the outdoor space we have in out gardens is reducing. It’s more common now to turn any garden over to drive way space and all that remains is a tiny balcony or patio garden instead of a large back garden with a swing set and vegetable patch. Since we first moved into our own home, we have grown vegetables in some form or other. In pots, in a green house, on my windowsill and more recently in out allotment plot. Growing in a smaller place like a pot or a raised bed has many advantages over a large patch in the garden. Pests can be detected and dealt with a lot easier. You can adapt the soil to the plants you’d like to grow. Less weeding to do etc. So don’t be dis-heartened about having to grow in a small space. Enjoy the opportunity it gives you to explore the possibilities instead. Even if you do have a large patch to grow in, if you’re anything like me, I love managing to squeeze an extra few plants in so here’s a list of ways to grow a crop in a variety of spaces. If space is tight but you still want to feed your family then this is a great tip. You can use the natural world around you to produce free, tasty food. Cleavers, nettles, apples, rose hips, wild garlic, cherval, all grow wild and a whole host more so check out what grows in the green spaces around you and go for it. 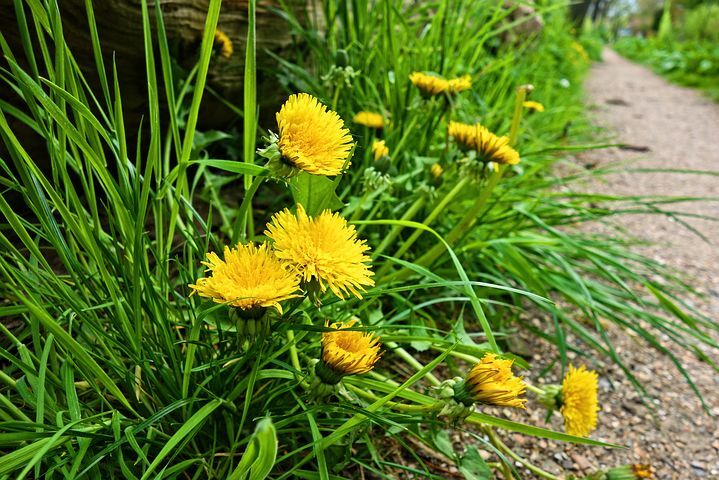 Dandelions are a wonderful weed to eat. They have so many uses and every part from root to tip is edible. Don’t eat anything you cant identify 100%, a lot of wild food looks like other plants that are poisonous so be aware and be careful. I’d also steer clear of mushrooms as these are easy to mix up. Want to start your own vegetable garden?? Find out how by signing up below! Front gardens, especially in the UK are laid out in traditional ‘show gardens’ A bright face on the house to welcome guests and give the world a good impression about the people that live within. However, there’s so much more you can do with a front garden and I don’t mean pave it. There are lots of medicinal and edible plants that are pretty enough to appear in the flower border alongside your ornamental plants. Instead of evergreen shrubs, or topiary balls in pots – why not plant a rosemary bush that can be clipped to give an evergreen backbone to your garden but also has uses in the kitchen. Calendula flowers are pretty, amazing for bees and the petals are edible in salads and on soups etc. Why not pop in a small tree to add height to a border. An apple or pear tree will add spring blossom, dappled summer shade and fresh crunchy apples? Red kale is architectural and a wonderful back drop colour for warm coloured flowers. Red chard is striking in its colour and has large leaves that are edible like spinach, while the stalks can be boiled and eaten as a vegetable. Purple podded peas and yellow and red tomatoes etc. all add height, colour and intrigue to a garden space and taste amazing. Check out this post for some unusual but beautiful vegetables to try in your flower beds. If you really are tight for space and you don’t have a flower border to grow things in what do you do?? THe next step would be to go up the way. 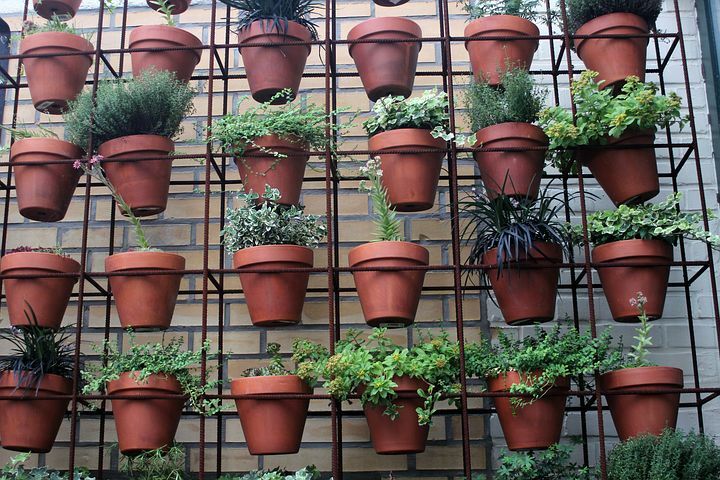 Do you have a sunny wall or fence you could repurpose into a vertical garden? Simply fastening a square of trellis to the wall or fence can give you countless possibilities. If you have a small patch of soil or a few pots to plant in. As the plants grow they will scramble up the support and soon you’ll have a feast for the eyes and your tummy. You can buy trellis, however it is easy to make a prettier one from bamboo, willow or hazel simply woven together. Last summer, we had one rectangular planter on our patio, with a willow support. Up the support we grew some runner beans and a couple of sunflowers and around the base of the beans, we grew a couple of festival pumpkins. They all grew together well, attracted lots of polinators and produced a wonderful crop of beans and pumpkins we’re still working our way through. Another advantage to growing in small spaces is you have a huge variation in areas to grow. One corner may be bathed in sun all day and another might be in shade for most of the day with a few hours of morning sun. Each enviroment has its good and bad points but no area is a bad area. You simply need to explore the area to discover a wealth of plants that fit every situation. People often say to me they can’t grow vegetables as their garden is too shady. Not so my friend, not so!! Lettuce for example is a lover of cool spaces as is wild garlic. Very often it will bolt to seed and be useless in a hot sunny spot but if you grow it in pots, you can move these around to find dappled shady areas where your lettuce will remain cool and growing well. You can also grow herbs in shady areas! Leafy green herbs such as parsley, and mint, do well in the shade where as thyme, rosemary and sage like dry hot conditions to do well. 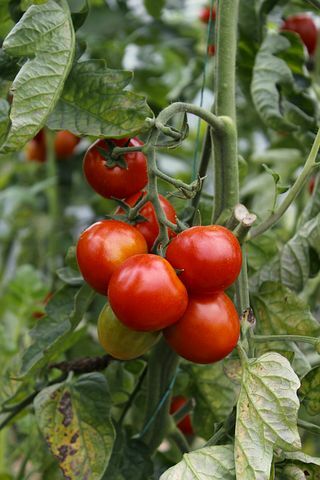 Growing vegetables seasonally is an important step when your tight for space. Trying to grow vegetables out of season means more room has to be given over to cloches and covering the crop against the cold. Growing in season means you can concentrate on foods your going to eat. Don’t grow vegetables just because your neighbour says you should if your not going to use them. Save the space for your favourites. You don’t have space for a field of onions or potatoes and they’re cheap enough to buy so don’t bother with these. Concentrate instead on the expensive or hard to get special vegetables that you can add to your diet without the high price tag. Container gardening is an great choice for small spaces. You can control moisture and soil content easier than in the ground. Everything can be adapted to grow in a pot. You can even buy fruit trees that thrive in a pot. Even potatoes can be grown in a pot. Large plants like pumpkins have smaller varieties for pots. Just put 3 to a large pot and top up the soil. Soon you’ll have amazing small potatoes to pick when you fancy them. You might have to keep a close eye on watering in pots. Hanging baskets can be adapted to grow vegetables too. Lettuce, tomatoes, herbs, chives, beetroot, strawberries, and chard all grow well in hanging baskets, as well as, edible flowers like violas, and calendula. Check out this post from Mom It Forward for more edible ideas for hanging baskets. Just make sure to check the water level regularly. With container gardens, it’s important to feel the soil well. 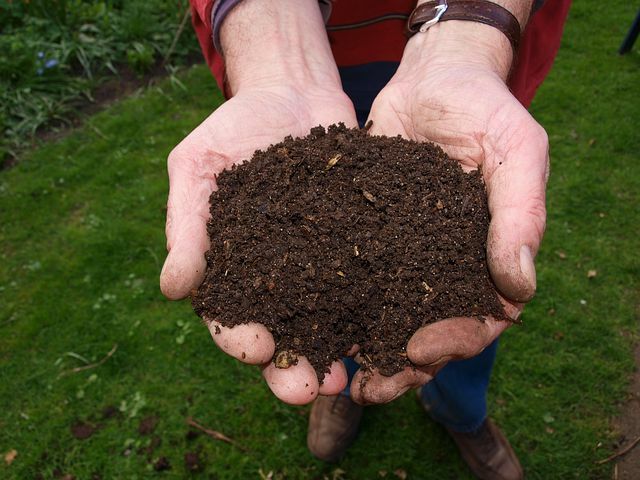 Use scraps and leftovers to create your own black compost that will give your vegetables everything they’ll need. Container gardening can be intensive, and your plants are completely dependent on you to provide nutrients they can’t get anywhere else. Check this post to find out how to start your own heap. You can use your windowsills or a window box for more than just a fake potted plant. You can grow a wide range of flowers, herbs and vegetables on your sills. Try cut and come again lettuces, a bush tomato or even a lemon grass plant. Windowsills are also amazing places to start seeds and to grow on cuttings. 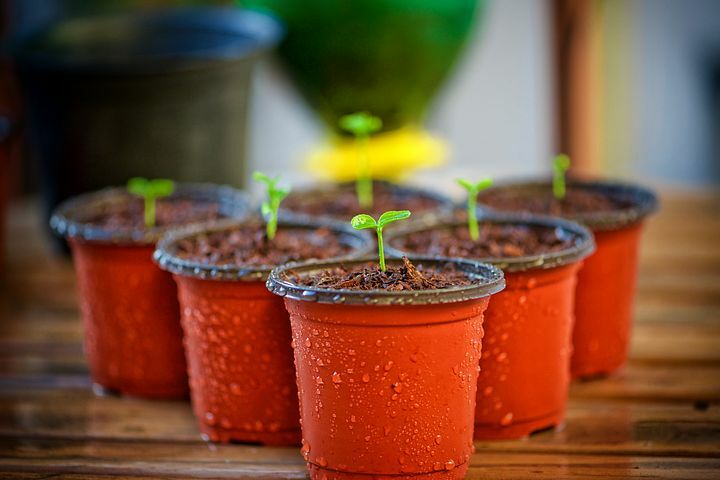 Check out this post for some great left overs you can grow on your windowsill. Consider edible plants that also add color and interest to your garden. Purple sprouts and Swiss chard are nutritious cold weather crop you can grow right now. Chives, lavendar, Violas and calendulas all have fab edible flowers, you can add to salads or just use as a garnish. Here is a list of the 12 easy crops you can grow at home. 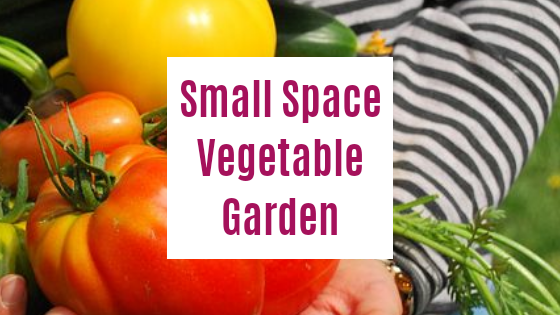 What’s your favorite thing about small space gardening?? 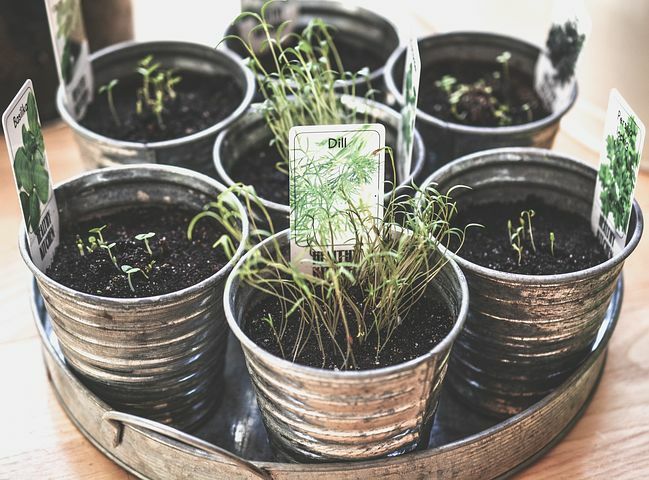 Small space gardening can be exciting and open you to a lot of new ways to think about gardening. We have very little space in our garden. My wife and I have always tried to utilize every bit of it which means little space for plant life and vegetable growing. However i’s beginning to look a little lifeless at the moment so we’re wracking our brains for the best way to add some plant life. This is perfect thanks so much.